"The United Nations is the greatest fraud in history. It's purpose is to destroy the United States." "The age of nations must end. The governments of nations have decided to order their separate sovereignties into one government to which they will surrender their arms." "We do not want another committee, we have too many already. What we want is a man of sufficient stature to hold the allegiance of all the people and to lift us up out of the economic morass into which we are sinking. Send us such a man, and whether he be God or devil, we will receive him." No one will enter the New World Order unless he or she will make a pledge to worship Lucifer. No one will enter the New Age unless he will take a LUCIFERIAN Initiation." Robert Muller is a self-confessed Luciferian New World Order leader, and a former Assistant Secretary General of the United Nations. Muller is one of the foremost leaders in the New Age/New World Order Movement whose #1 goal is to produce Antichrist so he can rule the newly formed global government. In fact, Muller claims his Guiding Spirit is none other than Master Diwhal Khul [Master D.K. ], also referred to as the Tibetan. This demon was the Guiding Spirit of Alice A. Bailey, Director, House of Theosophy, as quoted above. "If Christ came back to earth, his first visit would be to the United Nations to see if his dream of human oneness and brotherhood had come true." Muller, by the way, is associated with the Lucis Trust, a New Age organization that evolved from the Lucis Publishing Company, previously known as the Lucifer Publishing Company. During the presentation in Arcadia, a film was shown in which the United Nations armies were brought into a West African nation to bring 'peace'. They encountered several hundred civilians, and thus opened fire on them with machine guns and rifles. Vividly shown in the film was one lady carrying her child. The head of the child suddenly exploded as a .30 caliber machine gun bullet blew it open like it was a watermelon, and then another bullet struck the mother and she fell down. The masses, the several hundred women and children eventually were all slaughtered by the United Nations troops who had come to bring 'peace', and they joked and laughed about their job and how they had completed that and now must get on and find others. The United States Program for General and Complete Disarmament in a Peaceful World summarizes the official U.S. plan for transfer of all U.S. military assets to the United Nations. This program, first made public in 1961, is moving forward at a frightening pace. (THE NEW AMERICAN, November 29, 1993 and September 19, 1994.) On May 10th, Marines at the Twenty-nine Palms Marine base in California were given a "Combat Arms Survey" which posed a number of alarming statements to which the Marines were to register their agreement or disagreement. The final statement, #46, posed the situation in which the federal government had banned the possession of all "nonsporting firearms" and had required all Americans to turn over their weapons to authorities. The Marines were asked if they would be willing to fire on Americas who resisted gun confiscation. When THE NEW AMERICAN first broke the story, the damage-control spinmeisters at the Department of Defense assured everyone that this was an isolated incident which only involved an officer gathering information for his master's degree thesis. Since then, however, another Marine has provided us with a copy of the same survey which was given at his base, Camp Pendleton, California. Coming in the wake of PDD-25, the flurry of anti-gun legislation in 1993-94, and the grisly carnage perpetrated in Waco due to the Administration's irrational zeal for gun confiscation, alarm is justified. 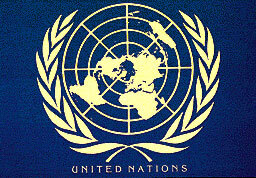 Delegates from 50 nations met in San Francisco on April 25, 1945, for what was officially known as the United Nations Conference on International Organization. During a two-month period, they completed a charter consisting of 111 articles, based on the draft developed at Dumbarton Oaks. The charter was approved on June 25 (6/25=6+2+5=13) and signed the next day; it became effective on October 24, 1945, after ratification by a majority of the signatories. The bonds of the wartime alliance undoubtedly hastened agreement on establishing the new organization. In systems such as Astrology and basic Numerology, eleven is considered to be a Master Number. Eleven can also represent sin; transgression and peril. Ten being the perfect number, eleven represents the exceeding of both. It is interesting to note that eleven when broken down (1+1=2) comprises the Two of duality. (LUCIFER tried/wanted to be equal to God) Number eleven is a master vibration and as such should not be reduced to a single number. People with this number could be both idealistic and visionary, and they are attracted to the unknown. They can be both unusual, interesting and magnetic personalities. Massive Terrorism Against American Cities! Eleven (11) is a sacred number. When eleven is multiplied by the perfect number 3, the number 33 is produced, a number of tremendous occult importance. In 1933, Adolf Hitler and President Franklin Roosevelt came to power. Both these men were committed to the establishment of the New World Order, and their actions impacted humanity greatly. It was also in 1933 that the First Humanist Manifesto was issued. Do you see how Satan manipulated world history to produce three New World Order events in 1933? Thus, a powerful 333 served as a framework for world events in that year. A copy of a top secret document has been smuggled out of the Executive Office Building in Washington DC. On transfer of sovereignty to the United Nations, those who do not conform to United Nations authority will be considered RESISTERS and declared ENEMIES OF THE GOVERNMENT. Public statements in support of the old ways and favoring continued United States nationalism will be considered ENEMY DOCTRINE. The PURPOSE for the build up of World Wars was to create a NEED for PEACE so that a UNITED NATIONS may be needed and then created as a SOLUTION for establishing peace between nations. A WORLD body of GOVERNMENT with a WORLD COURT and a WORLD POLICE to keep nations in place and to concentrate power into a few people's hands. Who's hands? William Howard Taft, Skull and Bones graduate of 1878, helped found the American Society for the Judicial Settlement of International Disputes in 1920. This soon became the League to Enforce the Peace, then the League of Nations and then finally The United Nations. If you look at things from a historical perspective, the U.N. today has implemented or is in the process of implementing all the planks of Adam Weishaupt's Manifesto. (In 1848, Karl Marx wrote the 10 planks of the Communist Manifesto, which he copied from an article written by Adam Weishaupt in 1797. This article was named "How to change a Republic into a Democracy." When George Bush took us to war in the Persian Gulf, he stated boldly that he didn't need the approval of Congress anymore to declare war because he had a U.N. Mandate. We have sacrificed a large part of our U.S. sovereignty. The U.N. has recently passed a Declaration of Children's Right's. It is now a RIGHT of the child to receive vaccinations, which do more harm than good, and a parent doesn't have the right to interfere. Parents who interfere with the rights of a child or abuse a child or are accused of abuse can have their children taken by the state. If you are seen spanking a child more than two or three times, the child abuse police will be unleashed against you. This amounts to nothing more than a giant power transfer, from US to THEM. The only way they can do this is by tricking us into thinking that we are so irresponsible that we cannot manage our own affairs and lives and that the state is better suited to raise our children. If you still like the U.N. then wait until you get hit with the new U.N. TAX that is coming. There are 33 sections to the United Nations inner emblem logo.